June Beechey (also known as Mrs Welsh) is one of Primrose Hill’s most loved faces, and a veritable icon (thanks to the Banksy look-alike artwork by street artist Bendi). Everyone loved going to June’s hardware shop. Bursting to the seams with organised chaos, everything you needed was there…plus things that you never knew you wanted until you saw them, but then realised that you did! June was a fountain of local knowledge: ‘keep your candles in the freezer, they’ll last longer’, and was always ready for a cheerful chat. It was a sad day for us all when, over three years ago, June had to pack up shop and move. But did you know Mrs Welsh isn’t June’s real name? R.J. Welsh was the name of the business when she and her husband Jim bought it in the late 1950s. And June isn’t her first name either, it’s Norma. She belonged to a club that had other Normas in it (including Norma Major) and Jim suggested she use her second name to avoid confusion. 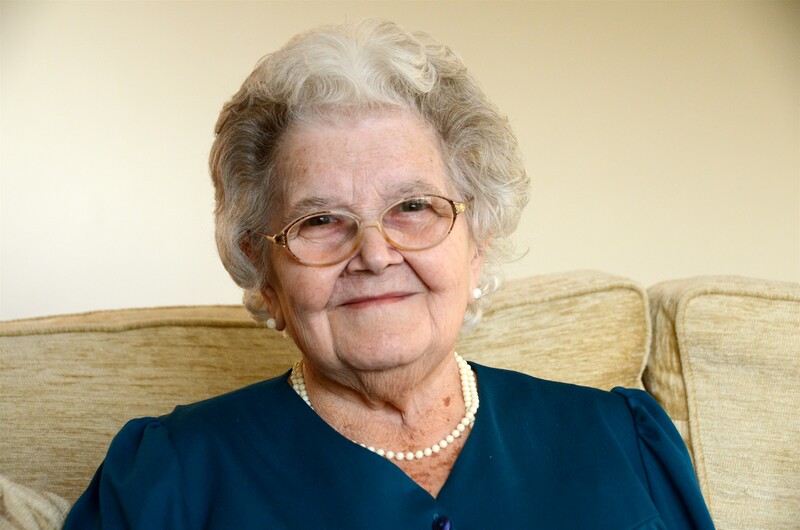 Born in Bushey, Herts in 1932, June and Jim met on a blind date set up by friends who didn’t turn up, and they courted over Philharmonic concerts at the Watford Town Hall. June worked in finance in Croydon for six years and then Jim bought the business in Primrose Hill after leaving the army. The couple lived over the shop where they raised two children, Lynn and Graham. It was quite a tight squeeze, but June would take the children to play in Chalcot Square, and they had holidays in North Wales with friends who had a house with 12 bedrooms. Both children went to St.Paul’s School when it was in Swiss Cottage, and June was the first Parent Governor there. Jim was a Governor at Haverstock and helped a lot of children to learn to read. When June first moved here she hated the dirt from the railways but immediately liked the friendliness of the place, which she feels is still present, in spite of the area becoming wealthier. People would ring her doorbell on Christmas Day if they needed a bigger turkey tray. Not so many years ago I needed one myself, and June had sold out. She ran upstairs and came down with her own for us to borrow. Typical June. The mainstay of the business in the beginning was paraffin: ‘smelly stuff’. All the shopkeepers helped each other, and there were a lot more shops. But once there was a murder: the butcher’s boy had taken a knife to one of the dairy lads. June saw the outline of the body drawn on the ground by the postbox when she went to post a letter. She remembers when Shepherds was a car showroom and the old betting shop sold American limousines. She and Jim had a Plymouth and then a Chrysler that had belonged to Douglas Fairbanks. Happily, June now lives in nearby Jacqueline House, but she finds it a bit hard these days to come and shop. Her cheery presence on Regent’s Park Road is much missed.